The first time I saw Henning Wagenbreth's »Cry for Help« next to the cash register in an art gallery bookshop, it practically leapt out of the point-of-sale rack at me. How could I turn my back? Wagenbreth's illustrated collection of scam e-mails from Africa is a riotously colorful gallery of suspect security men, poisoned hospital patients and dubious doctors. Like all his work, the book has a stunning immediacy. Wagenbreth is that rare rare figure: an emotionally engaging imagemaker who thinks like a designer. All the elements in his pictures are beautifully crafted and organized—made legible, you might say—to maximize their impact, and his lettering is handled with an unfailingly sure touch. It's the German graphic artist's twisted, tragicomic way of looking at the world, though, that makes his work not just technically impressive but compelling. His books, posters, and comic strips are some of the wittiest and mostgleefully energetic, yet at the same time dark, urgent, and grotesque graphic creationsto have emerged in the last few years. If you appreciate this kind of graphic art, Wagenbreth's output will almost certainly bring to mind the classic punk strips published in Art Spiegelman and Françoise Mouly's Raw in the 1980s. He is completly upfront about the influence of the trailblazing »graphix magazine for damned intellectuals«—as a Raw cover line once put it—on his work. Wagenbreth lives in Berlin, on Kollwitzstrasse, which takes its name from illustrous former resident Käthe Kollwitz, the graphic artist and sculptor who was inspired—as he is—by the Expressionists. The street used to be in Communist East Berlin; today it boasts palatial apartments at low rents, upscale bars, andnatty boutiques. A bookshop across the street from Wagenbreth has mounted an exhibition of his paintings. Images such as the maggoty reanimated corpse and creepy skul-headed workers in Wagenbreth's book about Napoleon might lead you to expect someone angsty, with a taste for tattoos and leather. Wagenbreth, now in his mid-40s, describes himself as an »outsider«—at least where the German design scene is concerned—but his manner is refined and easygoing, as befits a professor of visual communication who teaches two days a week. In 2000, Wagenbreth spent seven months in San Francisco, and he speaks in precise, calm, fluent English; he's rarely at a loss for the right word and can be disarmingly self-critical. Wagenbreth grew up in Eberswalde, a city north of Berlin, in the former German Democratic Republic. Bothe his parents were biologists. »I saw my father working in an institute, and the freedom of thinking and speaking was quite limited. They had friends who were artists, and the artists' community had much morefreedom in what they did and how they talked.« Wagenbreth opted for that greater freedom and studied graphic design at the Kunsthochschule Berlin. In the early '90s, he spent a year in Paris on a German-French artist' exchange. By looking at French graphic art and listening to the enthusiasms of French artists, he discovered the German roots of their imagery: the Expressionists and Neue Sachlichkeit (new objectivity) realists such as George Grosz, Otto Dix, and Christian Schad. »Somehow you have to go away from your country to be able to look back and understand where you are coming from,« he says. In paris, Wagenbreth also met Raw artist Mark Beyer—creator ofthe Amy and Jordan strips, masterpieces of comic despair—the most visible ifluence on his illustration, though Wagenbreth's line is tightr and more controlled. There are two prints and a drawing by Beyer on the living-room wall, while the hall provides a graphic tour of some of Wagenbreth's other inspirations: Japanese woodcuts, a couple of original Winsor McCay strips, a chart from India showing yoga positions. In a kitchen big enough to throw a decent party (sometimes he does) he displays music posters printed by Yee-Haw Industries of Tennessee, which he bought on the internet. Wagenbreth's early pieces are the most obviously expressionistic. In »Grosse Mausefalle« (1996), an illustrated collection of poems by the writer Alfred Lichtenstein, Wagenbreth elongates necks, gives people bloated turnip heads as big as their bodies, distorts their eyes, and twists their faces into masks of ugliness, hopelessness, and rage. He makes brilliant use of color, here just green and red, from which her extracts a great range of tones and textures so that the colors feel more varied than they are. Wagenbreth's power as an image-maker is grounded in a careful analysis of printing techniques. He collects and studies old printed pieces—he mentions some red and blue Mickey Mouse comic strips found in Paris—to learn their secrets. He paints plastic sheets with black ink and than scretches the ink away to make the drawing, or draws directly on transparent paper. This is then copied onto the printingplate without a film stage.»I think it's a major problem today that technology can override personality because the programs are all written in a special order, and they dictate some of the results,« he says. He attributes his eventual mastery to physics. By designing two-color posters in, say, orange and green, he learned all the different shades he could obtain. »Then I added a third color and tried to find out all the possibilities with the little amount of color avaiable.« People sometimes accuse him of insensitivity for using garish colors, but this ignores the inventiveness and subtlety of his palette. This requires a delicate balance, because much of Wagenbreth's work has been created for clients. Magazine illustrations and theater posters have provided a steady source of work, though he thinks the illustrated poster is more or less over now in Germany, at least for now. In 2004, Wagenbreth devised 26 pixelated weekly strips for the newspaper »Die Zeit« titled Plastic Dog, an elaboration of an earlier idea to produce cartoons for the Palm Pilot. Plastic Dog is a mutant mixture of human, animal, and artificial material, and the stories, told in eight images, extrapolate present-day social and technological trend to comment ironically on what might happen in the future. In one strip, Plastic Dog visits an arcade where young people play violent computer games, unaware that the military is using it remotely to fight real enemies. »The players have the fastest reactions,« says Wagenbreth. »Over the network you could let them steer the missiles. You could save the money spent on soldiers, and they wouldn't have guilt. They don't even know they are killing people in reality.« There is no escape from retribution, though. In the final panel, a misdirected missile has distroyed Plastic Dog's house. Wagenbreth brings the same analytical outlook to bear on technology that he directs at printing and color. For several years, he has been working on Tobot, an automatic illustration system—»It had to do somehow with toys and robots«—that allows him to call up pre-drawn image components with the keyboard. Sets of pictures completed to date include faces, rockets, cars, houses, politicians, and warfare, and it's possible to mix and meld characters from different sets in composite drawings. Wagenbreth compares the effect to the surrealist game of Exquisite Corpse, where each player makes an addition to a drawing without seeing what the other players have done. Tobot's techno-fusions can be equally bizarre: Wagenbreth offers the example of nose and throat doctors running like soldiers to fight a voracious suitcase. 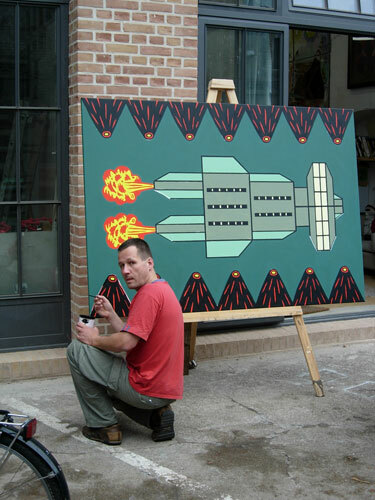 He has used the system to generate images for commissioned projects, as well as a series of large-scale Tobot paintings, and he might someday release it as a commercial tool. Cry for Help, on the other hand, was constructed from laborious, old-fashioned, handmade linocuts. Wagenbreth started collecting scam e-mails from Africa in 2000, scooping about 150 from his inbox and from friends. The book documents criminal activity, but it also dramatizes, with gentle humor and just the right blend of satire and sensitivity, the vast inequalities between Africa and the most of the West. The illustrations' focus on key motifs, plotlines, and cunning devices for getting under the recipient's skin helps to draw attention to the e-mails' status as imaginative and halfway plausible works of fiction and even, perhaps, as a kind of revealing underworld literature. »I try to make work that has a political side,« says Wagenbreth. The modesty of his self-deprecating manner, like the gaiety of his hues, belies the power of his images.